During our July Wisdom Council meeting a number of pre-retreat elements were discussed including the theme of our 28th Annual Fall Sacred Path Men's Retreat commencing on Thursday, October 15th. It was decided by consensus that we would focus on an issue that has been core to "men's work" since it's conception, and that's "the father wound." In my book, The Sacred Path: The Way of the Spiritual Warrior, I also refer to it as "The Father Gap." There's something else that has been resonating for me lately and that's the phenomenon of "authentic power" as distinct from "false masculinity." So, essentially when one comes to terms with and heals his father wound, he is in a much stronger position to access authentic power. Those of us who have dedicated our lives to working with men have observed that many males, of all ages, carry a secret wound that was inflicted upon them by a father who was heavy handed and went over the top, crushing the boy's spirit, or by a father who was missing in action and goes down and out of his son's life. Males often bear unspoken shame and grief from having missed out on a loving and caring relationship with their fathers. I also believe that many fathers carry wounds that are inflicted by their children. Children manifesting a variety of different forms of conduct disorder including addictive behaviors can suffer wounds on parents that are quite debilitating. I have witnessed another phenomenon that is increasing these days and I refer to it as the "Parent Estrangement Syndrome" in which a number of generation X'ers, who are entering and moving through their 30's, are distancing themselves from their parents, cutting off contact, sometimes for years. It appears as a disturbing form of individuation in which the offspring kick hard as they push off on their own, leaving bruised and beleaguered parents in their wake, as they sever ties and gain momentum to create as much distance as possible. During the October retreat we'll make it possible for participants to focus on the wounds that they carry. Those delivered by their fathers, or by their children, or the wounds worn by the one who did the wounding. As we heal the wounds, however they may have been inflicted, we offer ourselves the opportunity to repair the 'holes" to our psyches and return to "wholeness" and authentic power. 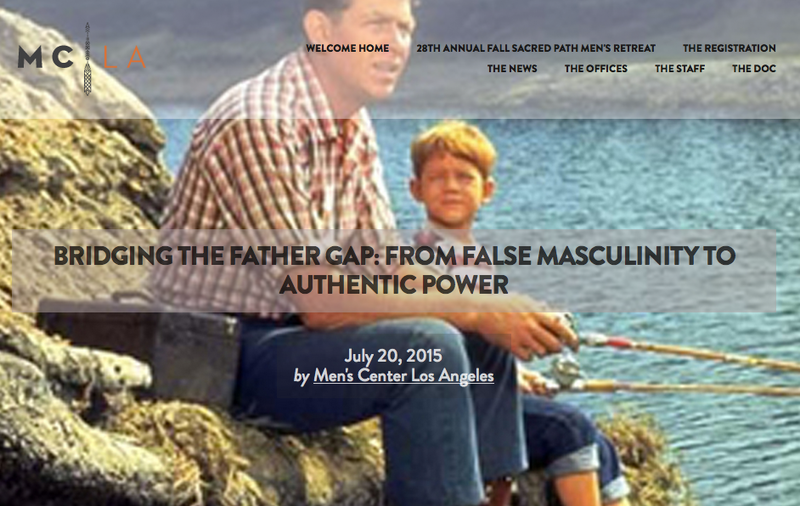 For further information read my brief article, included in this newsletter, titled Bridging the Father Gap: From False Masculinity to Authentic Power. It's said that America is a sleep-deprived nation. If you're one of the millions who suffer from some form of sleep disturbance you'll want to read Dr. Bruce Figoten's concise and informative piece on what to avoid and what to do to improve your sleep. It's got some new insights based on current research that I wasn't aware of . . . Have a look: "Rules to Get Your Best Night's Sleep. We're making one last request of you to consider, if you haven't already done so, a contribution for Artwan Green's GoFundMe campaign to raise the funds to support his being able to register for the Fall semester. He has about 25 units remaining to graduate. $1,375 has been raised thus far toward the goal of $4,800 required by early August. If he can get within $900 of paying off the entire balance, he'll be abe to register. He has earned $2,000 while working at a camp in Pennsylvania over the summer and can apply about $1,000 of that toward his balance owing. That along with the $1,375 puts him closer to his goal, but not enough at this point to put him in position to attend for the Fall semester. If he can pull together another $1,525 we can consider the campaign a success. Again, whatever you can do to help him continue his education uninterrupted would be appreciated so that he doesn't have to sit out a semester. He's very grateful for the assistance that the MCLA community is providing. Registration is now open for our Healing the Father Wound: Accessing Authentic Power 28th Annual Sacred Path Fall Retreat. I want to call to your attention that the fee for the retreat is $495; however, we are offering some discounted rates to inspire early enrollment as well as an expanded enrollment. When you sign up early, prior to Thursday, September 10th, your fee is $445. Do the math, a savings of $50! Another advantage is when you invite someone who hasn't been to one of our retreats before, he'll be able to come for only $350, our welcome-to-newcomers fee. So, if you bring someone new and you sign up early, your total fee for the two of you is $795. If you decided to just split it down the middle, each of you is attending for less than $400. Anyway you choose to cut it, you've got some nice incentives to be up on "the hill" with us in October. And, we're putting together an outstanding program that we'll tell you more about as it comes together. Give thought to who in your life you'd like to give the gift of a lifetime. As you undoubtedly know, if you've been on retreat one or more times, it's a life changer. Many men have discovered a fuller sense of self and purpose through their having stepped onto the Sacred Path. Our vision is to have a community of 75 men on retreat which is comprised of 60 participants and a staff of 15. Please help us to achieve this goal. A community is only as strong as its members and it takes each individual member to do his part in contributing to the whole. Thank you for doing your part in supporting this event.
. . . AND for the women who care about them.